In economics, profit maximization is the short run or long run process by which a firm may determine the price, input, and output levels that lead to the greatest profit. Neoclassical economics, currently the mainstream approach to microeconomics, usually models the firm as maximizing profit. There are several perspectives one can take on this problem. First, since profit equals revenue minus cost, one can plot graphically each of the variables revenue and cost as functions of the level of output and find the output level that maximizes the difference (or this can be done with a table of values instead of a graph). Second, if specific functional forms are known for revenue and cost in terms of output, one can use calculus to maximize profit with respect to the output level. Third, since the first order condition for the optimization equates marginal revenue and marginal cost, if marginal revenue and marginal cost functions in terms of output are directly available one can equate these, using either equations or a graph. Fourth, rather than a function giving the cost of producing each potential output level, the firm may have input cost functions giving the cost of acquiring any amount of each input, along with a production function showing how much output results from using any combination of input quantities. In this case one can use calculus to maximize profit with respect to input usage levels, subject to the input cost functions and the production function. The first order condition for each input equates the marginal revenue product of the input (the increment to revenue from selling the product caused by an increment to the amount of the input used) to the marginal cost of the input. 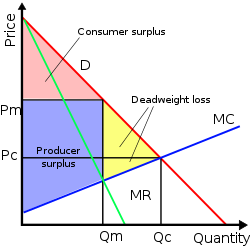 For a firm in a perfectly competitive market for its output, the revenue function will simply equal the market price times the quantity produced and sold, whereas for a monopolist, which chooses its level of output simultaneously with its selling price, the revenue function takes into account the fact that higher levels of output require a lower price in order to be sold. An analogous feature holds for the input markets: in a perfectly competitive input market the firm's cost of the input is simply the amount purchased for use in production times the market-determined unit input cost, whereas a monopsonist’s input price per unit is higher for higher amounts of the input purchased. The principal difference between short-run and long-run profit maximization is that in the long run the quantities of all inputs, including physical capital, are choice variables, while in the short run the amount of capital is predetermined by past investment decisions. In either case there are inputs of labor and raw materials. Any costs incurred by a firm may be classed into two groups: fixed costs and variable costs. Fixed costs, which occur only in the short run, are incurred by the business at any level of output, including zero output. These may include equipment maintenance, rent, wages of employees whose numbers cannot be increased or decreased in the short run, and general upkeep. Variable costs change with the level of output, increasing as more product is generated. Materials consumed during production often have the largest impact on this category, which also includes the wages of employees who can be hired and laid off in the short-run span of time under consideration. Fixed cost and variable cost, combined, equal total cost. Revenue is the amount of money that a company receives from its normal business activities, usually from the sale of goods and services (as opposed to monies from security sales such as equity shares or debt issuances). Marginal cost and marginal revenue, depending on whether the calculus approach is taken or not, are defined as either the change in cost or revenue as each additional unit is produced, or the derivative of cost or revenue with respect to the quantity of output. For instance, taking the first definition, if it costs a firm $400 to produce 5 units and $480 to produce 6, the marginal cost of the sixth unit is 80 dollars. To obtain the profit maximizing output quantity, we start by recognizing that profit is equal to total revenue (TR) minus total cost (TC). Given a table of costs and revenues at each quantity, we can either compute equations or plot the data directly on a graph. The profit-maximizing output is the one at which this difference reaches its maximum. In the accompanying diagram, the linear total revenue curve represents the case in which the firm is a perfect competitor in the goods market, and thus cannot set its own selling price. The profit-maximizing output level is represented as the one at which total revenue is the height of C and total cost is the height of B; the maximal profit is measured as the length of the segment CB. This output level is also the one at which the total profit curve is at its maximum. If, contrary to what is assumed in the graph, the firm is not a perfect competitor in the output market, the price to sell the product at can be read off the demand curve at the firm's optimal quantity of output. This optimal quantity of output is the quantity at which marginal revenue equals marginal cost. The intersection of MR and MC is shown in the next diagram as point A. 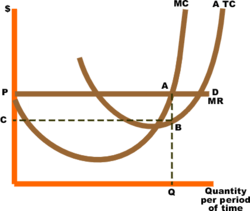 If the industry is perfectly competitive (as is assumed in the diagram), the firm faces a demand curve (D) that is identical to its marginal revenue curve (MR), and this is a horizontal line at a price determined by industry supply and demand. Average total costs are represented by curve ATC. Total economic profit is represented by the area of the rectangle PABC. The optimum quantity (Q) is the same as the optimum quantity in the first diagram. If the firm is a monopolist, the marginal revenue curve would have a negative slope as shown in the next graph, because it would be based on the downward-sloping market demand curve. 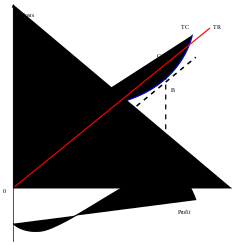 The optimal output, shown in the graph as Qm, is the level of output at which marginal cost equals marginal revenue. The price that induces that quantity of output is the height of the demand curve at that quantity (denoted Pm). In an environment that is competitive but not perfectly so, more complicated profit maximization solutions involve the use of game theory. In some cases a firm's demand and cost conditions are such that marginal profits are greater than zero for all levels of production up to a certain maximum. In this case marginal profit plunges to zero immediately after that maximum is reached; hence the Mπ = 0 rule implies that output should be produced at the maximum level, which also happens to be the level that maximizes revenue. In other words, the profit maximizing quantity and price can be determined by setting marginal revenue equal to zero, which occurs at the maximal level of output. Marginal revenue equals zero when the total revenue curve has reached its maximum value. An example would be a scheduled airline flight. The marginal costs of flying one more passenger on the flight are negligible until all the seats are filled. The airline would maximize profit by filling all the seats. A firm maximizes profit by operating where marginal revenue equals marginal cost. In the short run, a change in fixed costs has no effect on the profit maximizing output or price. The firm merely treats short term fixed costs as sunk costs and continues to operate as before. This can be confirmed graphically. Using the diagram illustrating the total cost–total revenue perspective, the firm maximizes profit at the point where the slopes of the total cost line and total revenue line are equal. An increase in fixed cost would cause the total cost curve to shift up rigidly by the amount of the change. There would be no effect on the total revenue curve or the shape of the total cost curve. Consequently, the profit maximizing output would remain the same. This point can also be illustrated using the diagram for the marginal revenue–marginal cost perspective. A change in fixed cost would have no effect on the position or shape of these curves. P = [PED/(1 + PED)] × MC. In words, the rule is that the size of the markup of price over the marginal cost is inversely related to the absolute value of the price elasticity of demand for the good. The optimal markup rule also implies that a non-competitive firm will produce on the elastic region of its market demand curve. Marginal cost is positive. The term PED/(1+PED) would be positive so P>0 only if PED is between −1 and −∞ (that is, if demand is elastic at that level of output). The intuition behind this result is that, if demand is inelastic at some value Q1 then a decrease in Q would increase P more than proportionately, thereby increasing revenue PQ; since lower Q would also lead to lower total cost, profit would go up due to the combination of increased revenue and decreased cost. Thus Q1 does not give the highest possible profit. The general rule is that the firm maximizes profit by producing that quantity of output where marginal revenue equals marginal cost. The profit maximization issue can also be approached from the input side. That is, what is the profit maximizing usage of the variable input? To maximize profit the firm should increase usage of the input "up to the point where the input's marginal revenue product equals its marginal costs". So mathematically the profit maximizing rule is MRPL = MCL, where the subscript L refers to the commonly assumed variable input, labor. The marginal revenue product is the change in total revenue per unit change in the variable input. That is MRPL = ∆TR/∆L. MRPL is the product of marginal revenue and the marginal product of labor or MRPL = MR x MPL. ^ a b c Lipsey (1975). pp. 245–47. ^ a b c d e Samuelson, W and Marks, S (2003). p. 47. ^ Samuelson, W and Marks, S (2003). p. 52. ^ a b Pindyck, R and Rubinfeld, D (2001) p. 333. ^ a b c Besanko, D. and Beautigam, R, (2001) p. 408. ^ a b Samuelson, W and Marks, S (2003). p. 103–05. ^ Pindyck, R and Rubinfeld, D (2001) p. 341. ^ Besanko and Braeutigam (2005) p. 419. ^ Samuelson, W and Marks, S (2003). p. 230. ^ Samuelson, W and Marks, S (2003). p. 23. Landsg, S (2002). Price Theory and Applications (fifth ed.). South-Western. Lipsey, Richard G. (1975). An introduction to positive economics (fourth ed.). Weidenfeld and Nicolson. pp. 214–7. ISBN 0-297-76899-9. Samuelson, W; Marks, S (2003). Managerial Economics (fourth ed.). Wiley. Profit Maximization in Perfect Competition by Fiona Maclachlan, Wolfram Demonstrations Project.